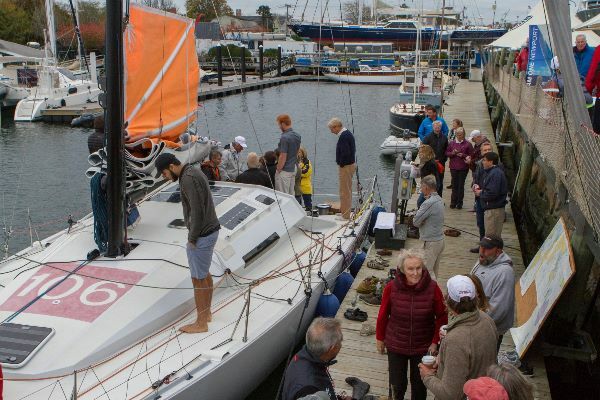 First- a massive thank you to all of you who trekked down to Newport Shipyard on Saturday to participate in our GryphonSolo2 Open House event. A ton of people came aboard to tour the boat- at one point I was concerned we were going to sink!- and I think everyone had a good time and gained a better understanding of how GS2 is put together. We then listened to three terrific speakers- Ken Campbell on the weather and routing; Merf Owen on the design characteristics of Class 40’s and GS2; and Herb McCormick on the history of solo racing out of Newport. A smaller contingent went on to the Clark Cook House in Newport for a great dinner that my friends Dave Rearick and Rob Windsor attempted to turn into a roast. Luckily it stayed fairly tame, even with old college friends in the house. So, after an initial departure date of Tuesday November 10th was scrubbed due to the tropical storm we are now experiencing, we are now looking at a revised departure time of either Saturday Nov. 14th or Sunday Nov. 15th. The goal is to get East quickly, passing north of Bermuda and then arc Southeast along a great circle path towards the waypoint at the beginnings of the Doldrums north of the equator. Hopefully the weather will cooperate and we can get out of dodge in a few days. The TeamOne Newport online store for GS2 gear is now open! 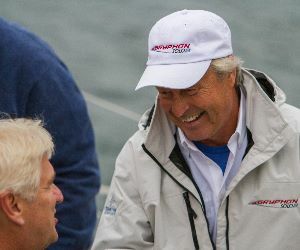 Martha Parker and her TeamOne crew have put together some really nice branded shirts, jackets and hats, so please go to the store via this link: http://www.team1newport.com/Gryphon-Solo-2/products/844/ . We have a new sponsor in New Zealand-based insurance company CBL Insurance, so we will soon be flying the CBL logo on the GS2 mainsail. Thank you to everyone at CBL for your support! So that’s about it for now- I will head down to Newport tomorrow for final prep and will be prepared to depart either Saturday or Sunday. we will have a photo boat out fort the start and are in touch with WSSRC officials to get an official start time to begin the record attempt. Waiting for yellow to turn to green to enter the lunar module Houston.